A small but vocal group of protesters gathered at the Ferguson Police Department on Wednesday after a scathing DoJ report confirmed the presence of ‘racial bias’ against black residents of the city. At least two people were arrested. The group of some 50 protesters started their demonstration by chanting on the sidewalks, but later moved into the street in front of the police headquarters, the St. Louis Post Dispatch reported. The protesters refused to leave when officers ordered them to. Two female protesters sitting in the street were arrested by the police, Democratic committeewoman Patricia Bynes said. Otherwise the protest remained peaceful. The arrests came hours after US Attorney General Eric Holder presented a searing report on law enforcement in Ferguson, which said systematic racial bias created “toxic environment” of mistrust in the predominantly black St. Louis suburb. 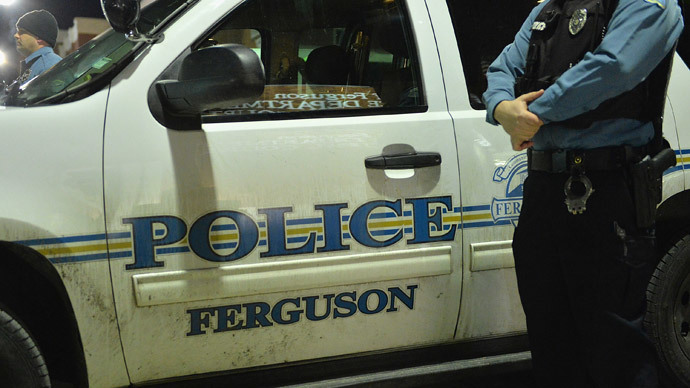 The report concludes a year-long federal investigation triggered by the street protests, which started after white Police Officer Darren Wilson shot to death unarmed black 18-year-old Michael Brown last August. This week the Department of Justice cleared Wilson, who has since retired from the force, of civil rights violations in relation to the Brown death. The situation in Ferguson and a number of similarly-loaded cases of black people killed by white officers of the law started a heated nationwide debate on police brutality and racial bias in the US.